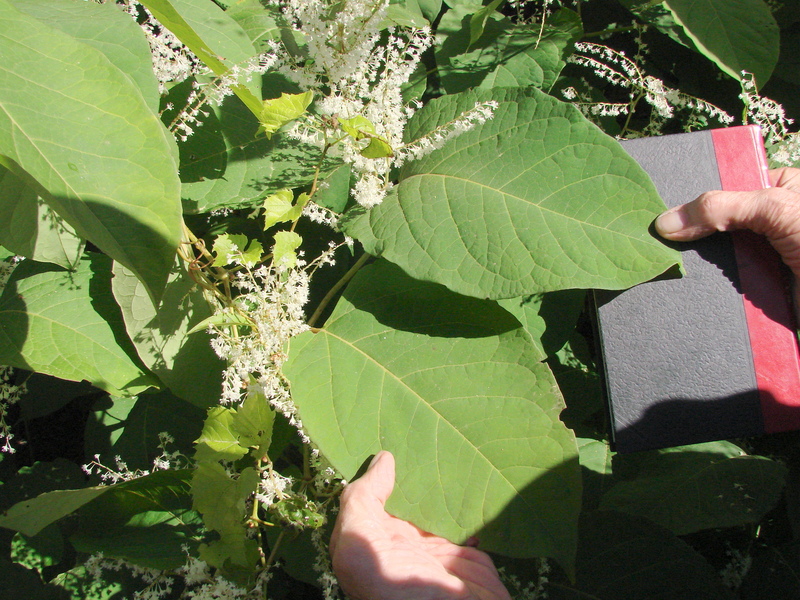 Today I accompanied Dr. Carl George from Union College into the field to look at the differences between male and female plants of Japanese knotweed, Fallopia japonica. 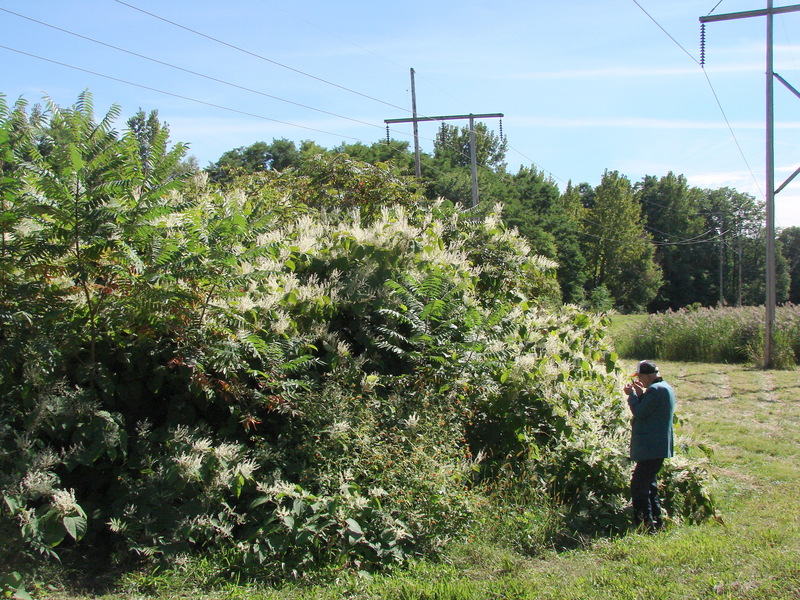 Our first stop was an area in Glenville with multiple clones of the plants, one of them female and the others male. What are the distinguishing characters? 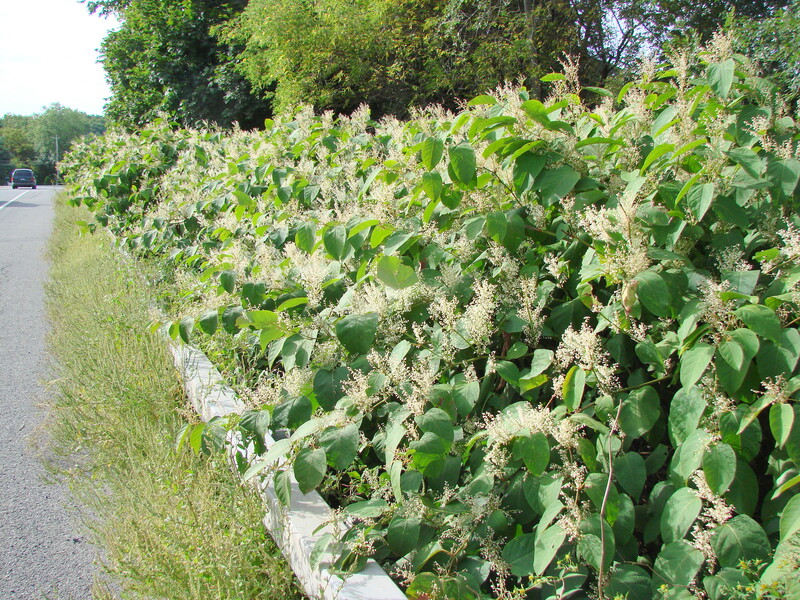 Male plants have erect inflorescences with bright white flowers and bigger leaves. These characters can be seen driving by in a car. The female plants are usually smaller with erect and drooping flower branches which are not as bright, probably due to the winged tepals and darker ovaries not present in the male plants. The male plants have flowers with five white petals that are spreading outward. They have long white stamens that are longer than the petals and we did not see any pollen in the open anthers. At the base of the flowers are tiny ovaries. The female plants have large ovaries topped by a three-parted stigma and small staminodes at the base. The five tepals are open when flowering starts and eventually three of them form large wings around the fruit. The remaining two tepals remain small in size, become erect and, hidden by the wings, they enclose the fruit. Today we saw four different populations of male plants, some of them large, but most of the plants we saw in the area were female. This is a good time of year to distinguish the two sexes so take time to look at the clones in your area and see if you can distinguish them. 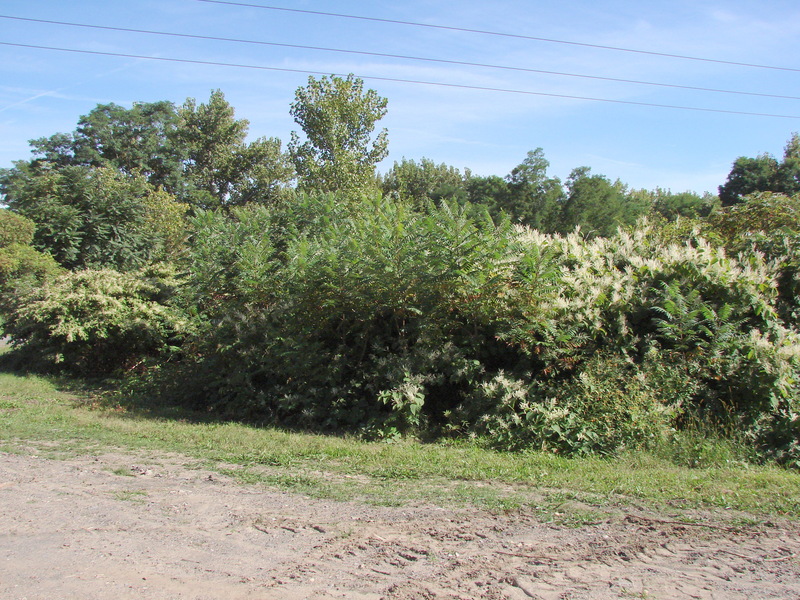 Here you can see the male plants on the right and the female plants on the left of a clone of sumac. Notice the large size of the male clone with the erect bright white flowers. Carl George examines the flowers. The male plants also had larger leaves than the female plants. 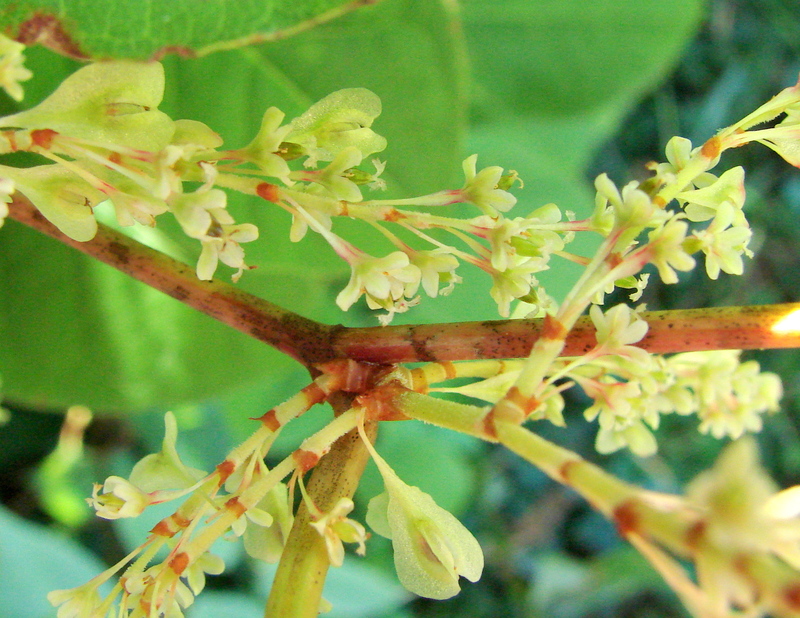 Notice how the female inflorescences also have drooping branches. Here are young female flowers with five tepals about the same size and older flowers with three of the sepals developed into the wings that surround the fruit. Here are the upright male flowers with the long stamens sticking out. 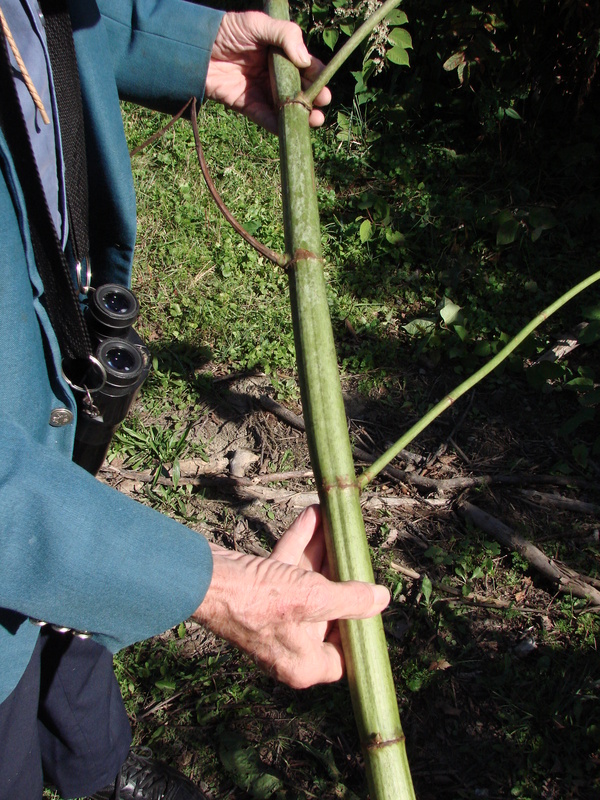 The hollow stems have a groove above the branches and they arise in a spiral fashion up the stem. A large male clone can be seen along a road in Pattersonville. The erect inflorescences are easily recognized. Even though they are swarming with honey bees, Dr. George found there is no pollen reward and their pollen sacs are empty. Here is another male plant in downtown Albany not far from a stand of female plants. The male plants are still easily distinguished in late September after the flowers fall because the upright branches remain while the female plants are still laden with white female flowers and fruits. The video is four minutes long. Great things on the horizon to protect our native orchids. Former NYFA board member Chris Martine, who now teaches at Bucknell University in Pennsylvania, has released his second in a series of videos about how plants are cool too. This one shows the actual plant leaves (not fossils) that were preserved in rock 15 million years ago! There were many interesting student and professional talks and posters at this year’s conference. The venue had rooms close together which made switching from one to the other easy, especially since we didn’t have to walk in from the front.The biggest challenge was the PowerPoint clicker ergonomics when speakers hit the forward button when they wanted to hit the laser pointer button. When will projector companies ever figure that out? For a list of the oral abstracts from the conference CLICK HERE. For a list of the poster abstracts CLICK HERE. NYFA judged the speakers for best poster, best student presentation and best overall presentation. We will announce them on an upcoming post. We look forward to 2013! – Steve Young. The poster session and refreshment table. A screenshot from the Floracaching website. CLICK HERE to see an excellent and beautiful publication on the identification and natural history of our native bees. For those of you focusing on the pollinators as well as the flowers, this publication will help you understand the diversity and behavior of our native bees. Staten Island Greenbelt Video. A Refuge for New York Flora.